"These MEPs will be found on the right side of history for the principled actions they have taken." 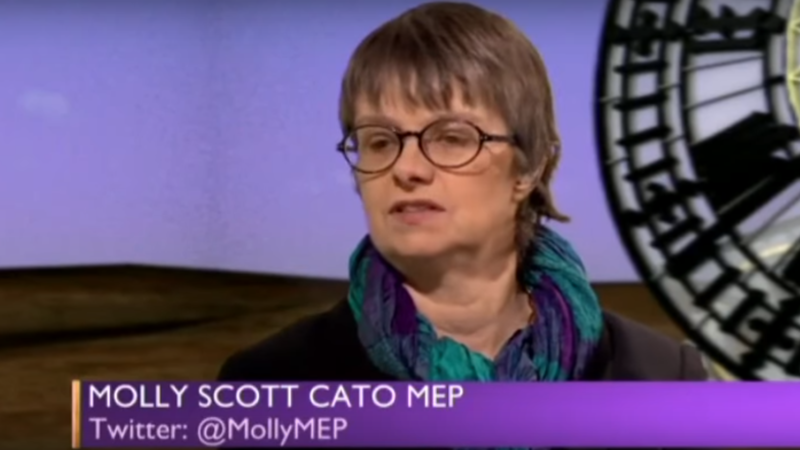 South West Green MEP Molly Scott Cato has been released from custody, after breaking into a nuclear military base in Belgium. Left Foot Forward contributor Molly Scott Cato is one of four MEPs arrested after breaking into a Belgian military airbase to protest against the stockpiling of American B61 nuclear bombs. Michèle Rivasi (France), Tilly Metz (Luxembourg), and Thomas Waitz (Austria) were also arrested as activists from “Agir pour la Paix” entered the Belgian airbase Kleine Brogel. The politicians were holding banners calling for a “Nuclear free zone for Europe” and blocked the runway of the F-16 airbase to request the withdrawal of US nuclear bombs on European soil. The MEPs were questioned this morning, with Scott Cato released just after midday. A spokesperson for the European Green Party confirmed Scott Cato’s release and said the other MEPs were expected to be released soon. “We stand in full solidarity with our brilliant MEP Molly and her Green colleagues who have been arrested for taking a stand against nuclear weapons. “These bombs have the potential to kill millions of people. They make us less safe, are obsolete in modern warfare and are a colossal waste of money. It is only right all US nuclear weapons are removed from Europe. “CND applauds this direct action. US nuclear weapons have no place in Europe – this isn’t a battle-ground for a nuclear war between world powers. “Our country is in a strong position to demonstrate how the nuclear states can work together to reduce and abolish nuclear weapons. “Our action is intended to challenge EU countries to remove US nuclear weapons from European soil. Each B61 bomb is 23 times more powerful than the bomb that devastated Hiroshima. These apocalyptic weapons should find no home in Europe. The Belgian police were contacted for comment.